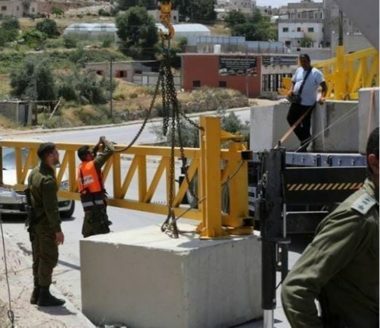 Dozens of Jewish settlers on Monday morning prevented cargo and tanker trucks from traveling to the Gaza Strip after blocking roads leading to Karam Abu Salem crossing. 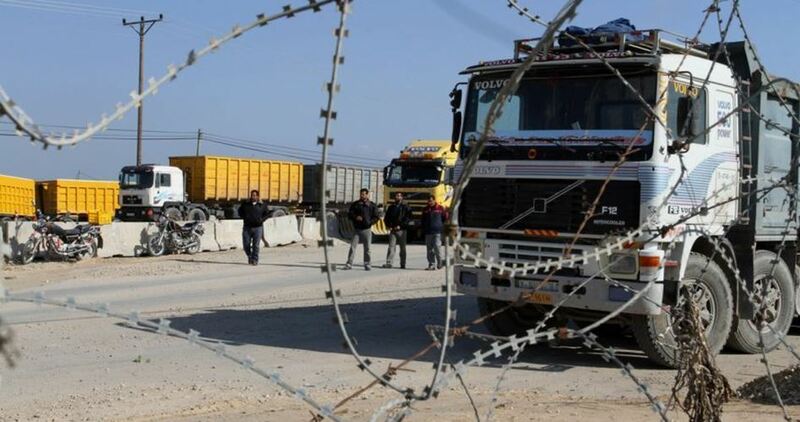 According to Israel’s Channel 2, settlers from settlements surrounding Gaza started to rally in the morning in front of the crossing, which is used to transport goods and fuel supplies to Gaza. Soon later, they embarked on closing off roads leading to the crossing and intercepted trucks. The channel said the settlers were protesting the military tension in southern Israel and the cabinet’s decision not to escalate the situation on the Gaza front. Israel’s Salem court has postponed Adnan’s trial until 29 October, and despite his deteriorating health condition, Adnan is held in solitary confinement and denied family and lawyer visits. The Palestinian Authority (PA), Palestine Liberation Organisation (PLO) and Fatah President Mahmoud Abbas received the envoy of Omani Sultan Qaboos Bin Said on Sunday. This visit came just two days after Israeli Prime Minister Benjamin Netanyahu visited the Omani capital Muscat. Netanyahu’s visit was preceded by an identical trip by Abbas earlier that week. Both met with Sultan Qaboos in Muscat, Wafa reported. According to Wafa, Sultan Qaboos’ envoy – Salim Al-Omairi – handed a message to Abbas thanking him for his latest visit to his country and noting that the visit reinforced the “deep fraternal relations” between the two countries. Wafa added that Abbas thanked Qaboos’ envoy and hailed the generosity he had experienced when in Muscat last week. Abbas also hailed the “large” Omani support for the Palestinian people, stressing that Palestine and its leadership is keen to reinforce this cooperation for the sake of serving the Palestinian cause. 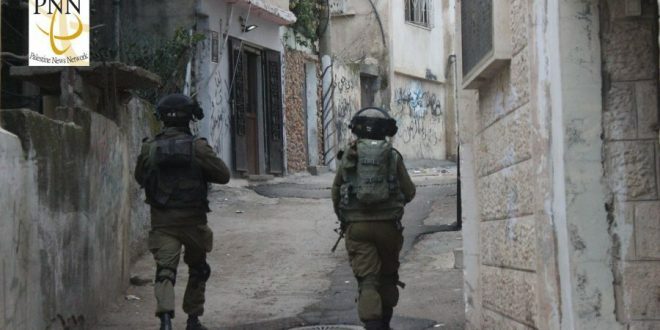 Arab-Palestinian activists in the Israeli town of Kafr Qasem, located on the Israeli side of the Greenline, will commemorate the 62nd anniversary of the Kafr Qasem massacre of 1956 tomorrow in which Israeli border police killed 49 Palestinian police. The event, which is also supported by the Kafr Qasem municipality, will include a march that will start in the Abu Baqr Mosque Square. The municipality and the committee organising the march called on all Kafr Qasem’s youth to be in the square early to receive participants coming to take part in the march. They also called on residents who live on the route to clear the roads of cars or any obstacles. They also asked residents to ensure not to pour water on to the streets so as to avoid causing an inconvenience to participants. Shop owners were also asked to keep their properties closed during the march in respect for the memory of the martyrs. Today marks the 62nd anniversary of the massacre of Kafr Qasem, which took place on 29 October 1956. Forty-nine people were killed while they were returning home from work because they did not know a military curfew was in place. 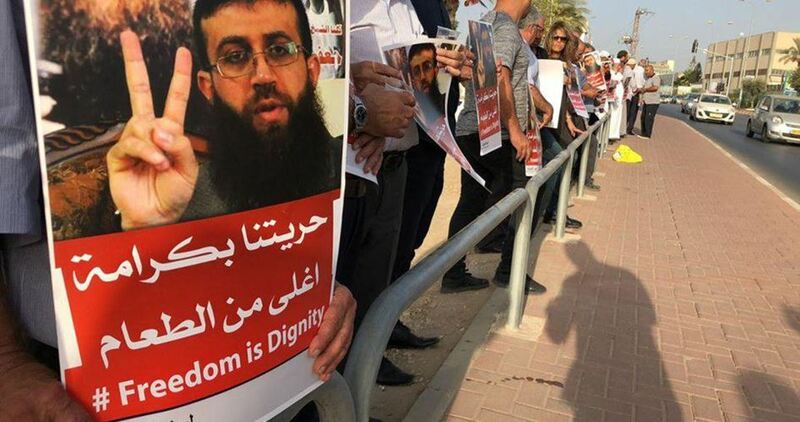 Hunger-striking Palestinian prisoner Khader Adnan is suffering serious health issues as a result of his 58-day fast, a Palestinian group says. The Palestinian Prisoner’s Club says Adnan was transferred to a medical clinic after he stopped taking supplements to help him survive the long fast. Adnan is protesting his incarceration without trial under what is known ‘administrative detention’. 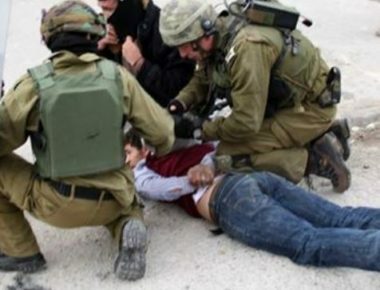 Israeli occupation says Adnan is a senior member of the Islamic Jihad, which is a Palestinian resistance movement, in the occupied West Bank West Bank. Mr. Shawan Jabarin, Al-Haq’s General Director, said that “in situations of armed conflict, the trade and business in natural resources have often been strong incentives for war and violence, and provided the finances necessary to maintain and prolong an armed conflict. The situation in Palestine is a case of such exploitation, in which Israelis and private actors have been deliberately and openly exploiting Palestinian natural resources for at least five decades. Israel, along with and through Israeli and international non-state actors, including corporations, have unlawfully extracted Palestinian natural resources in the OPT, without the lawful consent of the occupied population therein, and solely for the benefit of the Israeli economy and population, including illegal Israeli settlements. Israel has also permitted and encouraged private actors to exploit Palestinian natural resources. Such private actors include business enterprises in agricultural and industrial settlements, as well as Israeli and multinational corporations. Israel’s unrestricted and unilateral exploitation of Palestinian natural resources will eventually lead to the depletion of Palestinian natural resources, to the detriment of the Palestinian occupied population and in violation of Israel’s customary international law obligations. 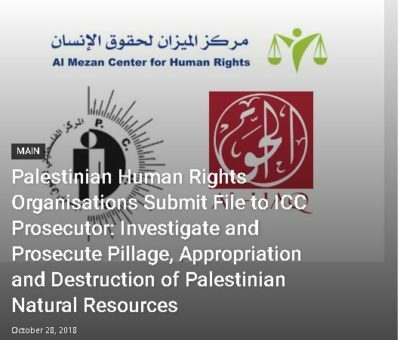 Furthermore, the appropriation, destruction, seizure, and pillaging of Palestinian natural resources have serious social, economic, and environmental impact on the affected Palestinian communities, and notably infringe on Palestinians’ fundamental right to self-determination. This is the sixth Article 15 communication to the Prosecutor of the International Criminal Court (ICC), and it complements the file submitted to the Prosecutor in September 2017 concerning inter alia the transfer of Israeli settlers into the occupied territory, appropriation of Palestinian land, and forcible transfer of the protected Palestinian population.